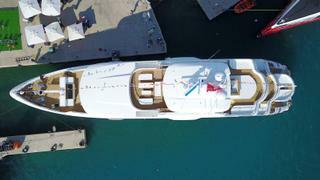 Turkish yard CMB Yachts has launched its 46.5 metre motor yacht Project Miracle, which has now been christened Liquid Sky. Splashed on August 24 in the Antalya free zone, she was built from a GRP hull and superstructure to RINA standards. MCA compliant, her exterior design comes courtesy of Espen Øino and her 495GT interior was styled by Beril Başaran of Artebel Design. 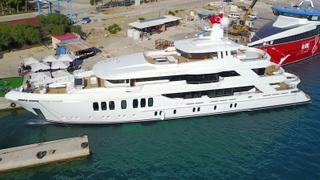 The yard adds that Liquid Sky will undergo sea trials before being given a public debut in Bodrum next month. She will then cross the Atlantic to attend the 2017 Fort Lauderdale Boat Show in November. Power comes from a pair of 1,450hp CAT C32 engines that allow for a top speed of 15 knots and a maximum cruising range of 3,000 nautical miles at ten knots. Her vital statistics include an 8.9 metre beam and a maximum draught of 2.47 metres. As these launch day photos below show, she features a curvaceous superstructure and a superyacht beach club with curved glass doors. 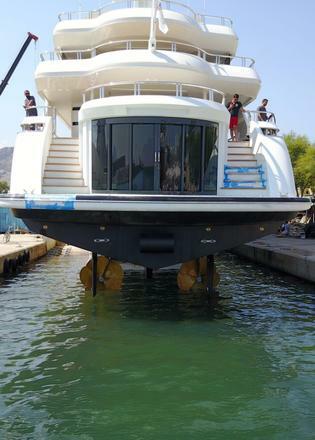 Liquid Sky can accommodate up to ten guests in five cabins, including an owner’s suite, two doubles and two twins. Meanwhile, her crew quarters are large enough for a staff of nine people. 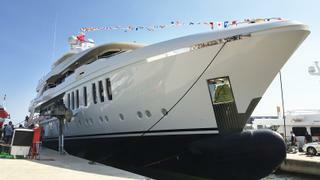 The Turkish yard has previously revealed designs for the 46 metre Project Magic and the 47 metre Project Mina.